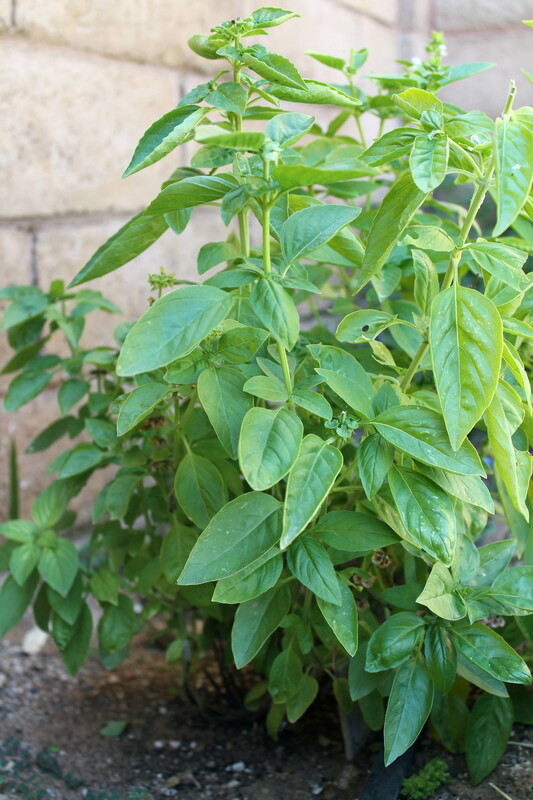 My parents’ garden has an abundance of tomatoes (and basil) at the moment. The past two summers we have canned homemade salsa, but this year I wanted to try something different. 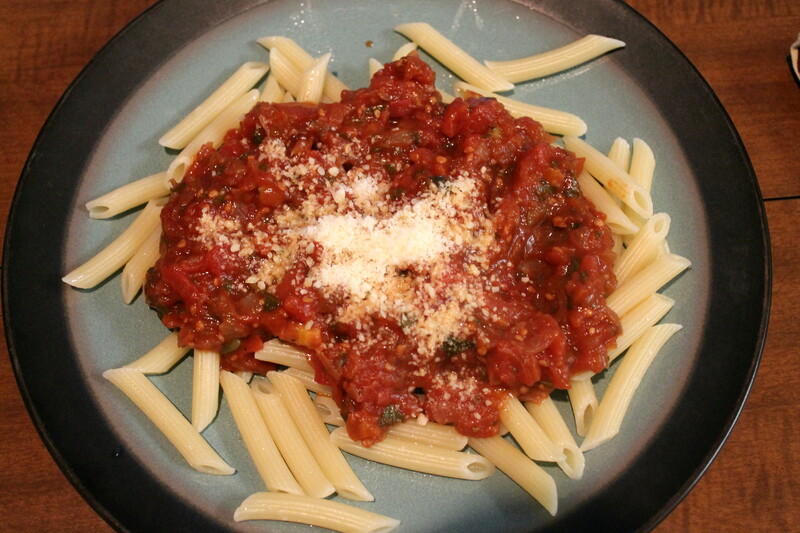 Enter homemade pasta sauce. Rather than bring out all of the canning equipment, we decided to use a recipe for pasta sauce that could be frozen. Frozen food preservation has many advantages over its canned food counterparts, namely that it’s less time consuming and more nutrients are retained. Since the tomatoes were picked within 24 hours of preparing this recipe, and since cooked tomatoes are one of the few fruits/vegetables that actually have a higher nutritional content when cooked, you can’t get much healthier than this. We chose a recipe from The Complete Book of Small-Batch Preserving (page 318). While the recipe indicated it would yield 8 cups, we ended up with about 6-1/2 cups. Still, it’s a good value compared to buying conventional pasta sauce in the grocery store. 8 cups of chopped, peeled tomatoes (about 4 lbs) — we used a mixture of Roma and plum tomatoes. See my tutorial below for tips on how to peel. 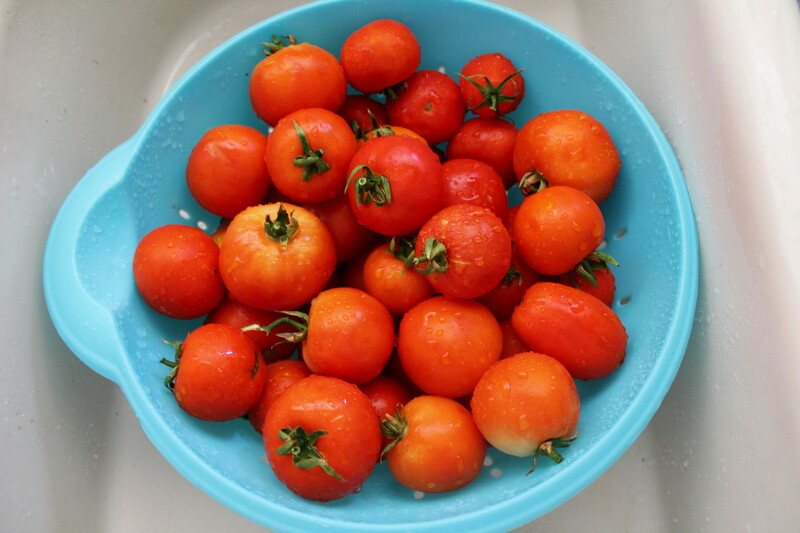 To peel your tomatoes, you’ll want to blanch them in boiling water. 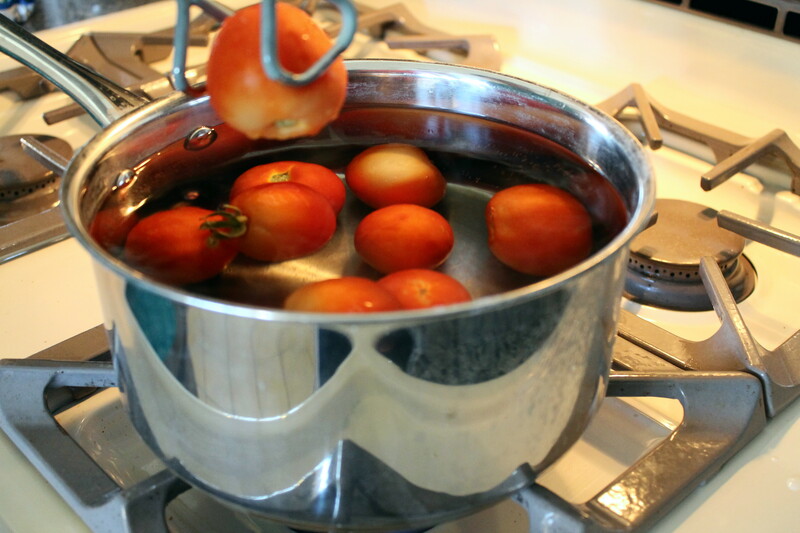 Bring a large saucepan of water to a boil, and submerge about a half-dozen tomatoes into the water at a time, allowing them to cook for about 1 minute. Remove from boiling water and submerge into a bowl of cold water. At this point the skins will slip off relatively easily, but you may need to make a small slit in each tomato with a knife to aid in the peeling process. Continue these steps until all of the tomatoes have been blanched and peeled, and you have 8 cups of chopped tomatoes. Next, heat the olive oil in a large saucepan over medium heat. Add the garlic and onion and cook for 8-10 minutes, stirring frequently. Add the tomatoes, wine, balsamic vinegar and red wine vinegar to the pot. Bring to a boil, reduce heat and boil gently for 40 minutes, stirring frequently. Stir in the remainder of the ingredients, return to a boil, and cook for another 10 minutes, continuing to stir frequently. Allow the sauce to cool for at least 1 hour before ladling into the freezer containers. The sauce may be refrigerated up to 1 week or frozen for up to 6 months. It’s also really good as a simple dinner served with pasta and a dash of parmesan cheese, or as an accompaniment to polenta dishes. 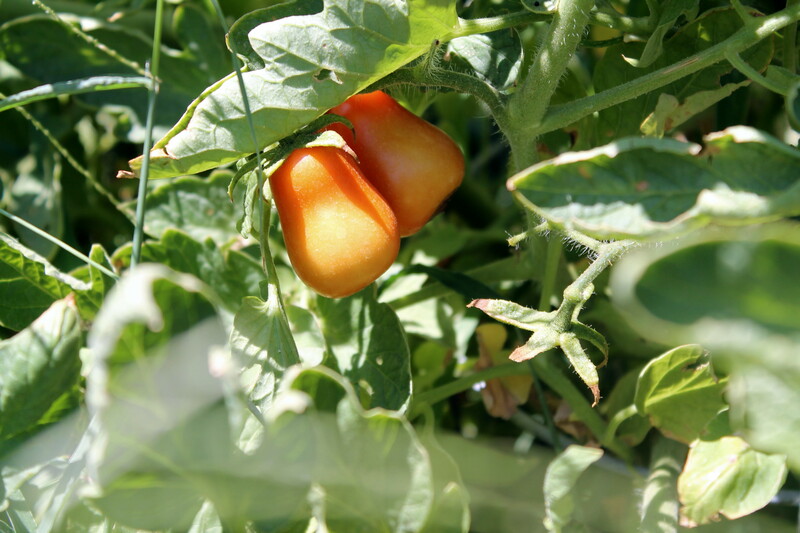 This entry was posted in DIY, Green Living, Healthy Living, Recipes, The Simple Living Experiment and tagged food, food preservation, pasta sauce, recipes, tomatoes. Bookmark the permalink. These are great pictures, Becky! Looks delicious.